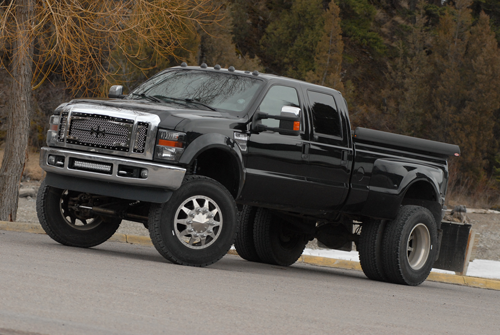 The Super Duty F-450 & F-550 trucks are a popular choice for conversion projects. These vehicles combine the amenities of a modern pickup truck with very impressive towing and hauling capabilities. The following information highlights some of the pertinent differences in the F-450/550 trucks as compared to Ford’s standard F-250/350 models. Gear Ratios and Tire size: The larger Super Duty trucks offered axle ratios of 4.30:1, 4.88:1, and even 5.38:1. Because a higher ratio number also means higher engine RPM, these ratios are considered deep as compared to an F-250’s 3.55:1, 3.73:1, or even 4.10:1 ratios. Stock tire size for an F-450/550 is typically 225/70/R19.5, which equates to just under a 32” tall tire. This is a smaller diameter tire as compared to 33”-35” and taller tires commonly found on today’s pickup trucks. The shorter tire will contribute to higher engine RPM particularly when paired with steep gearing. The Cummins engine makes is prime torque at low-RPM (1600-2000 RPM) which makes the F-450/550 gearing noticeable. Shifts will happen quickly and highway speeds may be limited. Some customers have opted for gear and tire upgrades to keep engine RPM at a comfortable level. Overall Truck Weight and Chassis Components: The F-450/550 load ratings are due to their larger axles, brakes, springs and chassis components. This results in a vehicle that can easily weigh 10,000-14,000 pounds. The F-250 & F-350 trucks in basic form primarily weighs between 4,500 and 8,0000 pounds. Service boxes, Tow Beds, and Commercial equipment mounted on a truck will add even more weight. The F-450/550 trucks will accelerate, brake, and generally handle differently than a conventional pickup truck.